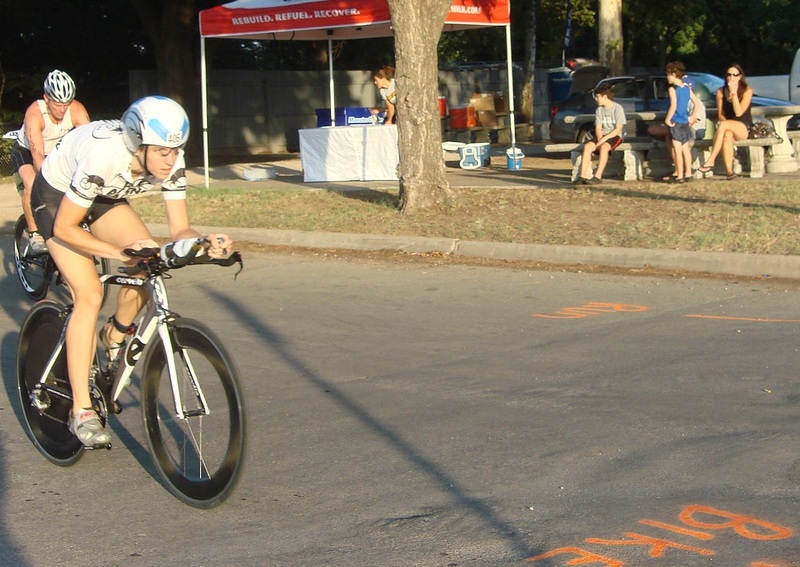 Austin Tri-Cyclist carries e load heat endurance and until August 6th you can get a special 15% Off any e load product when you mention our ATC blog post. Below is an except from eload about their product. The most important physiological job of your sport drink is to maintain your fluid and electrolyte balance. In hot conditions this can be especially challenging. A great sport drink helps in the prevention and control of heat stress, primarily by replacing sweat electrolytes and fluid as they are lost. If electrolyte balance is maintained within, and you supply enough fluid to replace losses (see our Nutrition Calculators) you are well on your way to success in the heat! 1..... that syptoms of heat stress include muscle cramps, stomach upset, stomach cramps, nausea, flatulence, diarrhea, headaches, dizzyness, unusual fatigue and delirium. Sometimes, a coma, and even death, can be blamed on extreme heat stress, as can a very important condition known as hyponatremia. 2..... that the most important ingredients in a sports drink responsible for the prevention of heat illness are adequate amounts of electrolytes. Virtually all sports drinks have a maximum of 1/6 - 1/2 of the concentration of electrolytes that you lose in your sweat. (8) Depletion of these valuable electrolytes are a big reason why heat stress leads to heat illness, including the ever common muscle cramps. The Anti-Cramp formula in e load™ has been helping cramping athletes everywhere. 3..... that Dextrose, the principal carbohydrate in e load™, is a high glycemic carbohydrate that is rapidly absorbed and yields instant energy. Additionally, dextrose is the carbohydrate of choice for a sports drink made to combat heat stress. The biggest reason for this is that dextrose actually facilitates sodium absorption from the small intestine, unlike other carbohydrates (1,2,3,4). This is why many oral medical rehydration solutions contain dextrose as the principal carbohydrate (5). Also, the presence of dextrose and sucrose together may enhance each other's absorption (enhanced 'solute flux'), and maybe more important than the osmolality of the carbohydrates themselves (37). 4..... that for optimal performance in the heat, replacing sodium and potassium (the two most abundant electrolytes in sweat) in the ratio in which they are lost from sweat means less chance of succumbing to heat stress. This ratio averages between 3:1 and 5:1 i.e. your drink should contain 3-5 times more sodium than potassium. Most sports drinks completely ignore this important physiological truth. 5..... that Lactic acid buildup from prolonged high level physical exertion acts like "muscle glue", and that its' accumulation may be more pronounced in the heat. Lactic acid causes muscle burning and heaviness, inhibiting normal muscle contraction, resulting in reduced performance. It makes sense to have an ingredient in your sports drink to counter these problems. Check out our lactic acid killing MultiCitrateTM (9). 6..... that everyone of you is different, with different sweat tendencies, and different levels of electrolyte in your sweat. In fact, there is a 50-100% variation in the levels of sweat electrolyte from person to person. We at Medion are well aware of the differences that exist in the physiology of individuals, and for those needing it, we enable you to ingest even more electrolyte with our innovative ZONE CAPS  (see Customizing Your e load™). 7..... that excess stomach acid is a problem for many people in stressful situations, causing stomach pain, cramps, nausea and vomiting. Exercise can be stressful, especially high intensity exercise in the heat, and the extra stomach acid secreted in these situations can contribute to gastrointestinal distress. e load™ addresses this issue with its' low acidity formula. In fact, compared to a drink like Gatorade, e loadtrade; has 35 times LESS acidity. 8..... that Calcium loss through sweat may actually predispose athletes to bone loss and stress fractures when inadequately replaced. An average loss of calcium per litre of sweat is 50 milligrams (which happens to be the amount found in e load ™) (38). In the heat, e load™ is like no other! For a more detailed breakdown of e load™ and the science behind it, please see "The Science of e load™". Relays get a bad rap – that is, when they're not being completely ignored, which is more often the case. The general tri-population will tell you that relays aren't "serious." But honestly, that's probably their best trait. There's no pressure in a relay. No one's going to critique your overall time, and at most, you're competing against a handful of other teams. You also tend to choose your strongest discipline, which in my case, eliminates worrisome questions before the swim start like, "Will I sink?" and "Will anyone stop me if I swim the wrong direction, or will I end up in the Gulf of Mexico first?" Relays are also a great way to focus on improving a particular area of competition, compete in spite of or after an injury, or ease new people into multi-sport. And sometimes it's just a fun way to participate when you're not in top shape for a tri and still want to punish yourself in a race environment. 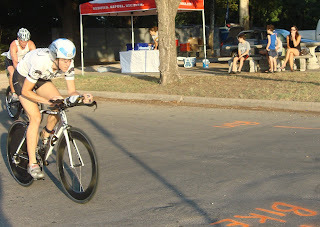 The Marble Falls Triathlon is probably my favorite local tri. The bike course is long (35k) and rolling, complete with a nasty climb at the beginning and a twisty, Mario Kart-style exit ramp before the final few miles back into town. Unfortunately, it also starts with a 1,000-meter swim. 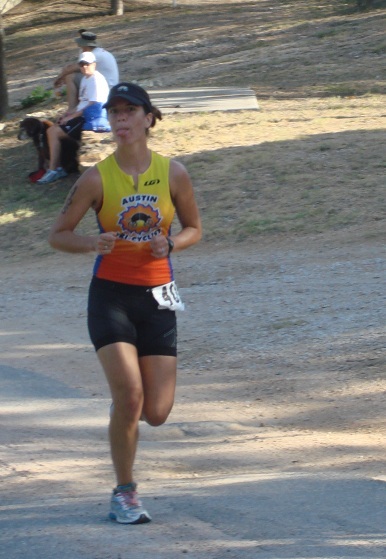 As much as I enjoyed myself at the 2010 race, after more than a year off from swimming and nearly four months off from running, there was no way I was going to sign up. When it comes to race entry, the aero-gear-or-no- aero-gear quandary, and other important life decisions, one should always consider the wise advice of Corey May: "Are the results on the internet? Well, there you go." The relay offered the perfect solution for our ATC trio. 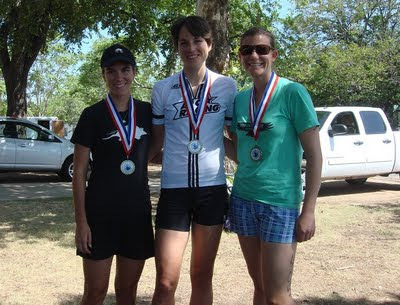 Cassidy Santaguida, a swimmer in high school and later on club teams, was interested in tri training and checking out the scene, and Rita Stroobandt, a collegiate runner, and I had both fallen off the wagon in one way or another. 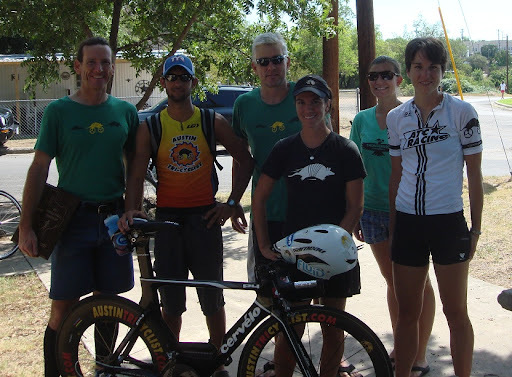 Rita had been recovering from a knee injury, as well as mentally recovering from Ironman Arizona, and I had more or less fully transitioned into time trialing and bike racing. We were put in the wrong swim wave, so Cassidy started her leg with the Women's 39 and under group. She was fourth or fifth out of the water, a position I would never in a million years have found myself in (oh, is that Kat just coming around the second buoy? Think we should send a rescue?). Nor would I ever have left the water feeling anything less than half-drowned, so taking off on the bike at full speed just behind the top women and Men's 34 and under group was a new experience. I was having so much fun that I started out going far too hard. Four weeks ago, after my husband's aluminum-P3-vs.-steel-sedan incident (the P3 lost, but the Toyota took a heavy beating) our communal Powertap had to be sent in for repairs. It was returned a few days before the tri, but it was my first opportunity in a long time to use it for a race, and I forgot to pay attention to the numbers or to give them the proper respect. After about 20 minutes, I slowed up considerably. My goal had been to catch and pass Maggi Finley, top amateur triathlete and my new teammate on the ATC Women's Racing cycling team (official announcement about the team coming soon). She had left the water ahead of our relay team and was moving fast, but I figured it would be a reasonable goal to try and catch her, since she wasn't strictly doing a TT. The joke was on me. 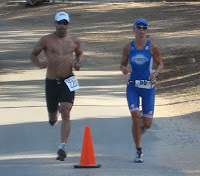 I caught up to her at the halfway point, just as she was coming around the cones and I was braking to start the turn. I had underestimated her strength – as soon as she saw me, she sped up and a sizeable gap opened up again. I was chasing her until about the final four miles, when the course turns back from Hwy 71 onto 281. I started to give it all I had left since I knew I was close. When I finally passed her, I croaked "Good job, Maggi," and thought that would be the end of it. Not a single guy had passed me on the course, or as far as I knew, had even tried to. So when a few minutes later Maggi came back around on my left, I was floored. "You know," she said, "that this is going to really mess up my run." I laughed, or tried to. After that, I got close enough to be too close, so I passed again…then she passed again… At one point I took off as hard as I could go on a steep hill, knowing that I was blowing up my legs and figuring she wouldn't try to keep up with the pace, but just after the hill she was coming around me once more. We both hit the brakes hard at the first stoplight in town, unsure of whether to turn left or go straight, with another cyclist just to our right. After the police officer had waved us through the intersection, the other cyclist was ahead, followed by me and then Maggi. He slowed down (I would have been nervous about me, too, at that point) through the last coned-in section, which meant that I came in just ahead of him and Maggi into transition, by accident more than by legitimate effort since the last section was simply too hectic and tight to re-pass. 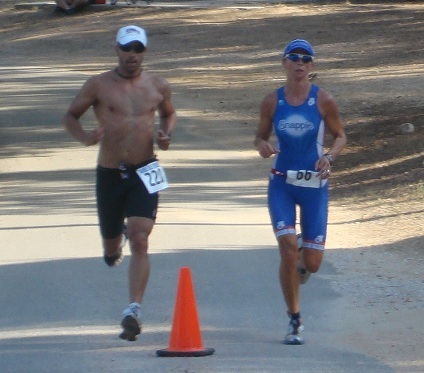 In transition, our relay team only needed to exchange the chip, so Rita started the run before Maggi. Through my post-TT haze I remember Rita saying something like, "Ha, no way." She was Maggi's "rabbit" for the first mile or so of the 4.4-mile run, and then Maggi won a firm victory against Team ATC, averaging 6:45 miles. But we don't feel too bad about having our three parts beat by one, since in the end Maggi not only came in first woman, but tenth overall. Our relay team came in first in the all-female relay division, seeing as we were the only all-female team, but we also had the best time among the mixed teams. So we got our medals and post-race barbecue feeling like we had accomplished what we had come there for, or maybe even a little more (that's what my muscles were saying, at any rate). And other ATCers took home top honors, as well - John Trowbridge was 7th overall and Master's Overall Winner, George Schmitz came in 9th overall, and Tim Dove took 2nd in the Clydesdale division. So why run a relay? And why feel good about being passed by girls with an "R" on their calves? Because first and foremost, triathlon is about having fun, and the more people involved, the better the present and future of the sport. Besides, when the girls are on a relay team, you have an excuse – you can say you weren't fully "chicked." 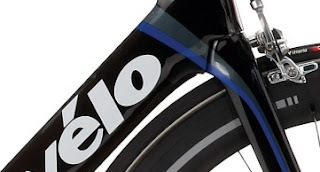 Since 2001, when Cervelo introduced their first aerodynamic road bike, the aluminum "Solo," their aero road bike designs have been considered the industry standard. The fastest frame in the world in its day, the Solo was the first road bike with airfoil shapes specifically tuned for the speeds and wind angles cyclists experience. 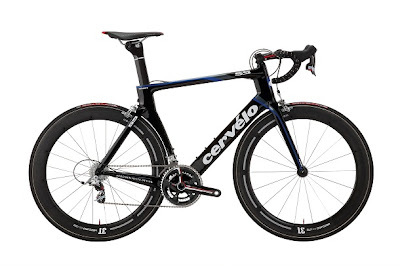 In 2005, Cervelo released the Soloist Carbon, which was showered with awards and rave reviews for its aerodynamic prowess, as well as its handling, stiffness, and ride quality. That design has remained relatively unchanged, with only minor tweaks and improvements through the S3, which was introduced in 2008. Despite the arrival of competitors in the aero road bike market, Cervelo held that the S3 remained top dog in the wind tunnel...until now. This is not merely another iteration of the S3, but a completely new frame, with new features never seen before on a road bike. The S3 has been dethroned. The S5 combines many of the best features of the P4 TT bike and the R-series lightweight bikes, giving rise to a road frame with all new geometry. The result, according to Cervelo, is a bike that has 12% better stiffness, better aerodynamics, and the comfort of the S3, and also weighs 80 grams less. At 25mph the S5 will save a rider 9 watts compared to the S3. And compared to many round-tube, non-aero frames, the S5 can save up to a whopping 32 watts at 25mph. 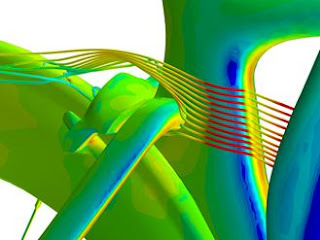 Even in a pack, where aerodynamic drag is reduced by 25 to 30 percent, a rider would still be saving between 6 and 20 watts. Anyone who owns a power meter should be familiar with how much of an advantage that can be. But the S5 isn't just slippery, it is also stiff and light and displaying amazing handling acumen under the guidance of Thor Hushovd in the 2011 Tour de France. Stiff and light enough for 180lbs of Thor to climb the Pyrenees, nimble enough to chase climbers down on rainy descents. The S5 features deep, airfoil seat stays which are very similar to those found on Cervelo's top TT bike, the P4. The shape is especially complex where it attaches to the seat tube, which serves to improve aerodynamics, shield the rear brake caliper, and provide extra vertical compliance for comfort on bumpy roads. 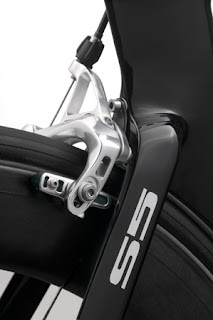 The S5 features a seat tube that is currently unique among road bikes. No other road bike has such a large extent of rear wheel coverage, and keeps the rear wheel in such close proximity to the seat tube cutout. This shields the rear wheel from the air, reducing aerodynamic drag. As the dropouts remain vertical for easy wheel swaps, this will limit tire size options somewhat. 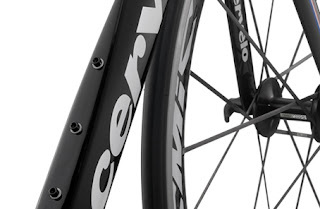 Cervelo reports that 23mm tires will fit, as will some models of 25mm wide tires. There is more to a road bike than aerodynamics. Road races often involve steep mountains where weight matters too. Cyclists sprint, attack, and corner at the limit, and stiffness is important for solid handling and power transfer. While the S3 has proven stiff and light enough for powerful riders like world champion Thor Hushovd, the S5 improves on the S3 by 12% in stiffness and 80 grams in weight. Part of this is achieved with the BBright system, first featured on the R-series frames. 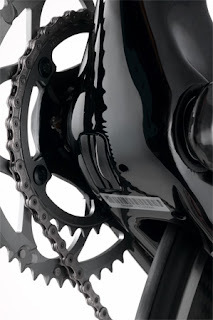 The asymmetric bottom bracket and chain stay design allow for a bottom bracket/crankset system that can be lighter and/or stiffer than a standard setup. Another feature reminiscent of the P4 is the dropped down tube. Cervelo combines an integrated fork that fits neatly into the frame and a dropped down tube that hugs closely to the front wheel. 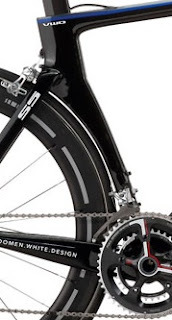 The design maintains an airfoil leading edge along this curve around the front wheel, rather than a cutout, which would add drag whenever the wheel is not pointed exactly straight ahead. A common point of skepticism about aero frames for bike racers is whether it is worth paying for sculpted aero down tubes and seat tubes if you are going to load them up with water bottles anyway. While Cervelo has maintained that aero tubes are faster than round ones even with bottles in front of and behind them, the S5 offers two features to improve on water bottle equipped performance. The first is a feature also found on the latest Lightspeed aero road bikes – a widened trailing edge on the down tube to shield the bottles from the air. Cervelo takes this water bottle philosophy a step further by offering two mounting positions for the down tube bottles. There is a low position to be used when carrying a single bottle, which reduces the gap between the bottle and the seat tube, smoothing airflow. When using two bottles, a higher mounting point is used that positions the two bottles close to each other to optimize airflow. This is another feature unique on the market right now. Specs, Pricing, Availability - Update: ATC has S5s in stock and ready to ride!